Members of Urban Youth Theater at Abrons Arts Center at a workshop with Morgan Bassichis and Ethan Philbrick of Klezmer for Beginners. 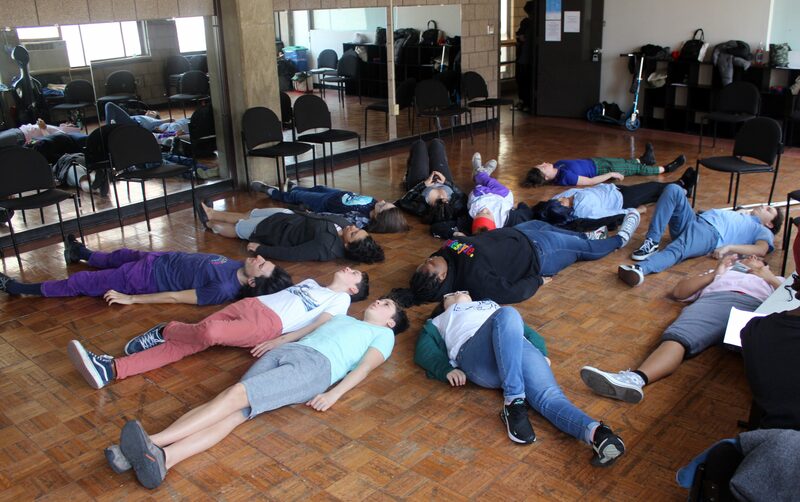 At the direction of comedic performer Morgan Bassichis, a dozen teens scrambled around the airy practice room at Abrons Arts Center to find a free square of floor. When they found their spots, a hush fell over the room, punctuated by nervous giggles. Bassichis, lying on the floor with them, took a deep breath and began leading the group in an exercise where they slowly built a song from the ground up without communicating with one another. Musician Ethan Philbrick sat in the corner, providing music on the cello. 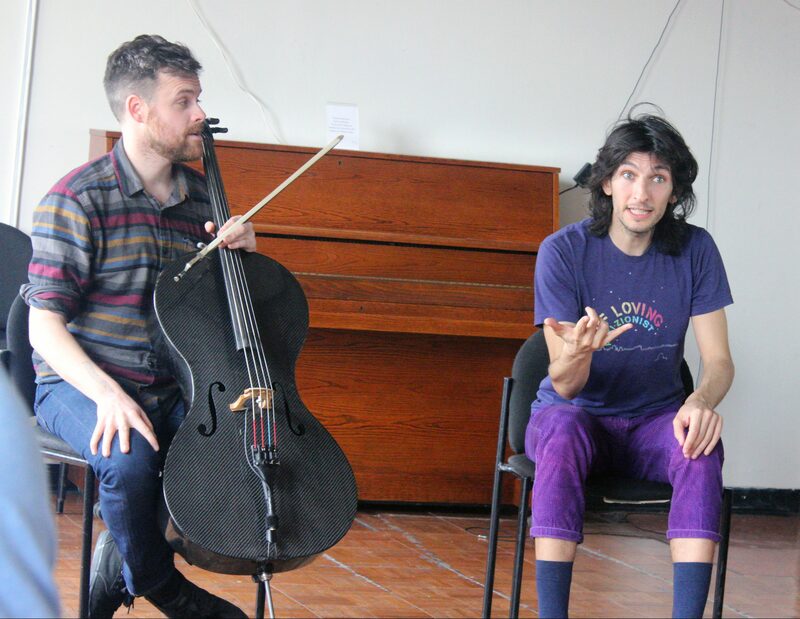 The two artists, who will premiere Klezmer for Beginners at Abrons Arts Center April 11 through 13, were leading a workshop for the Urban Youth Theater (UYT), Abrons’s free theater group for young people ages 13 to 19. Over a semester in UYT, participants work with one another to devise original theater pieces, culminating in a final performance in May. During the two-hour workshop on Saturday, March 30, the teens collaborated with Bassichis and Philbrick to build their improvisation skills. Workshop activities included movement- and discussion-based theater games, with students reflecting on the bonds they’ve built as a group since the beginning of the semester. Teaching artist Monique Moses oversees the group, which has been meeting every Saturday since early February. The workshop was particularly relevant for Moses, an actor-director who has performed improv and sketch comedy for the past decade. UYT participants reflect after improv exercises. After everyone got their chance to share, Philbrick and Bassichis performed an improvised song based on the conversation. The rest of the circle was captivated, marveling at their thoughts and ideas set to music. The workshop concluded with a collaborative exercise that tied it back to the upcoming Klezmer for Beginners. Bassichis and Philbrick performed a Yiddish protest song, and then worked with the youth to explore its history and devise a version applicable to present-day issues. “Art is such an important part of social justice. What we’ve been practicing—improv—is freedom; it’s about not just accepting the scripts that have been given to us,” Bassichis shared with the group before they performed a raucous rendition of their improvised protest song. Philbrick, left, and Bassichis, right, performing a song from Klezmer for Beginners at the UYT workshop. For Bassichis and Philbrick, Henry Street and Klezmer are deeply entwined. “We’re inspired by Henry Street and Abrons’s commitment to education and teaching—it led us to approach our piece as a learning project. It’s called ‘Klezmer for Beginners’ for a reason, we’re engaging in our own learning as part of the performance,” Bassichis said after the workshop. Klezmer for Beginners runs from April 11 to 13 at Abrons Arts Center, 466 Grand Street. Click here to buy tickets. UYT runs every fall and spring at Abrons Arts Center—no prior theater experience is necessary! Click here to stay informed about upcoming enrollment dates.